Weather change and pollution taking a toll on your skin? 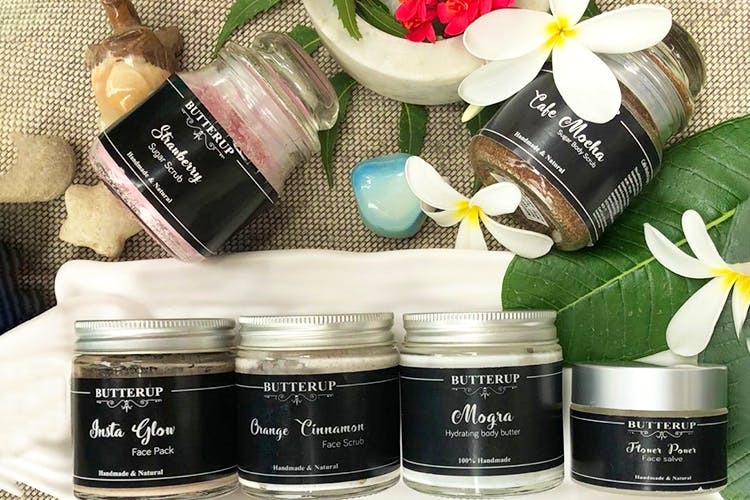 Bid adieu to skin woes, Butterup will leave your body feeling papered and fresh with their chemical-free products. This brand uses cold pressed oils and natural butters to create small batches of products that are safe and suited to all skin types (we tried them out). Scrub away that dead skin with this delicious body scrub . It gently exfoliates your skin to leave behind softer, skin with smaller, less exposed pores. The scrub has been handmade with organic sugar, shea butter and natural oils, it's suitable for all kinds of skin types. If you're familiar with the benefits of Rosehip oil, it's known to be the ultimate anti-ageing oil. This hydrating face salve is infused with Rosehip oil, grape seed oil and geranium oil. It helps prevent wrinkles and dark spots and leaves your skin looking fresh. Remember our grannies' concoction for glowing skin? This face pack is a natural and holistic blend of sandalwood, kesar and haldi, which reduces the appearance of scars and blemishes so you have clear, smooth skin. Get rid of dry skin with this natural and nourishing body butter with the goodness of olive oil, Shea butter and jojoba oil. The goat milk soap helps even excessively dry skin and makes it look much healthier. The combination of the two works wonders and leaves you feeling pampered and nourished. Battle acne with the goodness of orange and cinnamon. The orange helps give you a glow and cinnamon has anti-inflammatory properties. This creamy face scrub protects keeps breakouts bay and minimises skin damage. It also hydrates your skin and helps preserve its natural moisture.